Want to know where the ground is, how to get there, where to get in, where to sit and what to eat? Look further than here. We just give it you all!! Well the obvious place to look for a parking space is in the Priory Bridge car park by the river Tone and across the road from one of the main entrances to the ground. 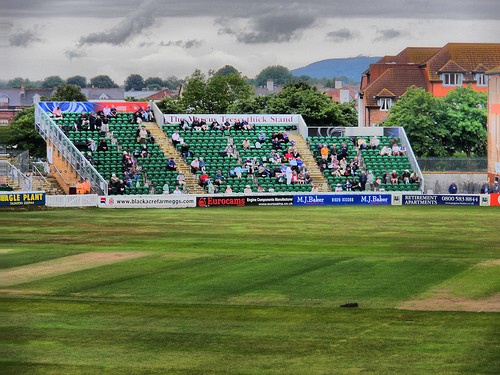 It is a large park but is used by the main town shoppers as well so you need to get there early on a match day. It also offers a daily rate for parking rather than limiting your time. This is also true of the parking above the Railway Station about 10 minutes walk from the ground along Station Road. Both of these parks charge at all times. All the roads in the vicinity of the ground are resident parking only designated so there is no side road parking unless you know someone who lives locally. There are two other main sites to try near the St James Street entrance. The Central car park is found by turning left at the mini roundabout and right across from the Princess Royal pub. It is the main town car park and as such is full most of the time. It is however FREE on a Sunday. If you go straight on at the mini roundabout and follow the road around, you will find yourself in the Brewhouse Theatre car park which is much smaller but worth a try. It is also FREE on Sundays. There is a park and ride from the Motorway with another situated out of the way on the Wellington side of the town and on big game days there are arrangements to park in Vivary Park on the other side of the town centre. For those arrangements the club website is the best place to check at the time. Short term parking is possible near the ground in the car park for Morrisons. Here a £1 ticket will allow you to stay there for 2 hours but unfortunately you then cannot return for 2 hours. But its an option for a short while. Priory Bridge Road Entrance - You would enter the ground from here if you have parked in the Priory Bridge car park or are coming up from the station past Morrisons. 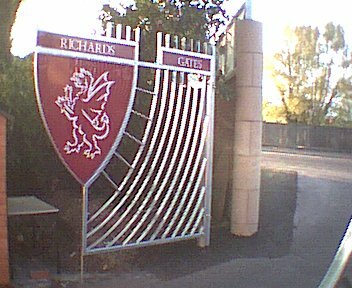 This is where the Sir Vivian Richards Gates are but you would enter through the turnstiles to the side of them. Members and Non-members can enter here. It brings you into the car park behind the Scoreboard seating area. There is usually no booked car parking here unless you are in the Long Room. St James Street Entrance - You would enter from here if you are coming in from the main town either up from the Debenhams store side of town or down from the East Road area. 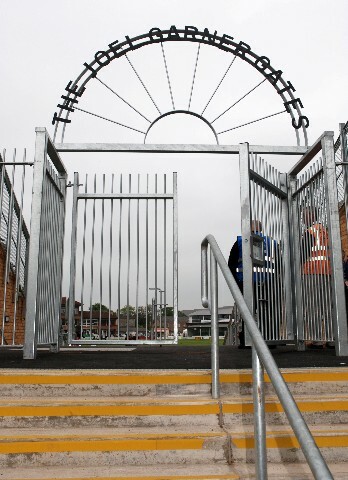 Here you will see the Jack White Gates but again will enter through the turnstiles on the right of them. This is also an entrance for Members and Non Members and brings you into the car park behind the Old Pavilion. If you have a car parting space booked within the ground this would be your entrance. 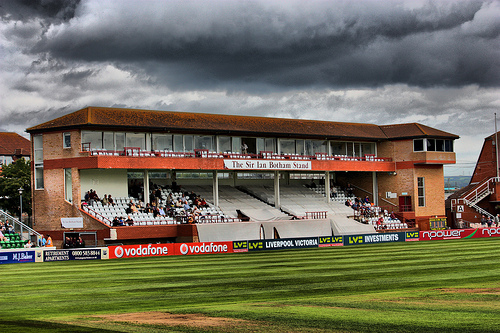 Somerset Stand Entrance - This entrance is the one you would use coming from the lower part of town or from Morrisons. It can be found at the rear of the Brewhouse Theatre at the right corner of the flats on Somerset Square. 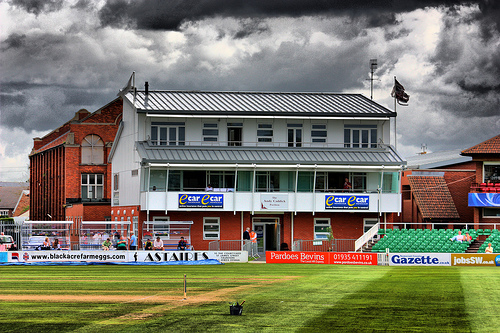 It brings spectators in to Gimblett's Hill and the right end of the Somerset Stand. It is not usually the place for paying Non Members and you may be sent to one of the other main entrances if you wish to buy a ticket on the gate. When a very large crowd is expected there is another entrance on this side at the other end of the flats, following the path down the side of the River Tone. 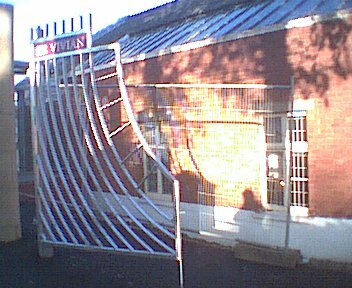 This is the Joel Garner Gates Entrance which may be opened for Members only on big match days. 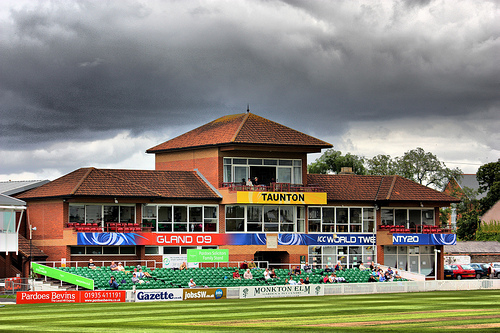 The large 2000 seater addition to the ground with a covered walkway behind it with information on the walls about great Somerset players of yesteryear and refreshment kiosks at each end serving snacks, beer and tea/coffee. It also has toilets built into it. This is for Members and Non Members most of the time though you can book seats here for the T20 games. It is not covered but is in the shade for a large amount of the afternoon because of the residential flats behind it. Moving down towards the River and the Joel Garner Gates we find ourselves arriving at one of the two buildings named after players who were still part of the first team when the stands were being used (is that unusual I wonder?). 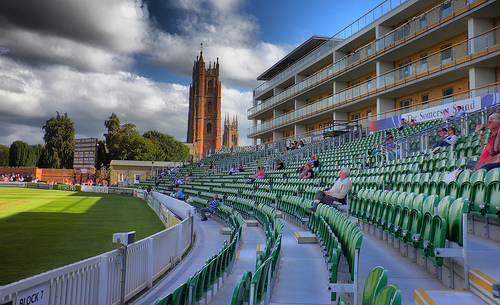 A very popular place for spectators partly because it is in the sun for a long time during a game and partly because it is a great venue for watching sixes fly over your heads into the Tone. 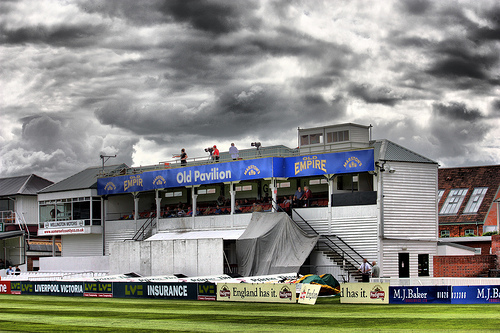 It is a Member Only stand for games other than the T20 ones when most areas are open to all. It has no cover. Next to it is a strange stand which sits at an angle and can have one third of the seats covered as a sight screen at any time. But it is a popular stand for Members Only and has a covered walkway behind it with a bar and fish and chip serving hatch. The food kiosk is very popular and can get very busy. If you want to queue here you can but be aware that you will see no cricket and can be there for up to 10 overs before being served. But the food is good quality and reasonably cheap. But go before everyone else does or choose one of the fish and chip outlets outside the ground. This area is the focal point of most supporters but is well frequented by those who pay on the day. 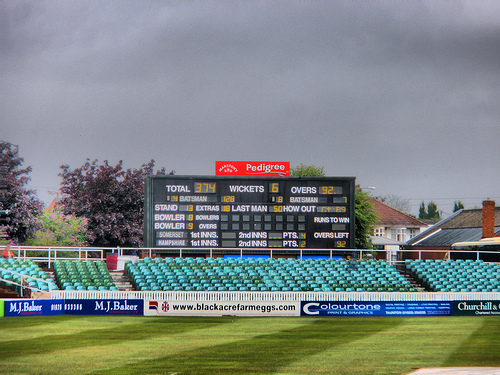 There is a refreshment kiosk in the base of the scoreboard selling hot drinks and snacks but the absence of a bar except in the Botham Stand can be a problem on this side for minor games. The bigger games see a temporary bar being set up in the car park to the right of this area but not for every game. 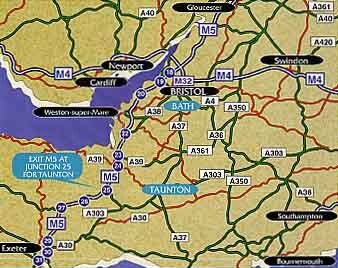 Presently it looks like this and is named after Sir Christopher Ondaatje who is one of Somerset's main investors. It houses the Indoor School at the rear of the building and behind it is the famous Somerset Cricket Museum in the old barn - well worth a visit to anyone interested in the ground and the game. A really excellent resource and FREE! 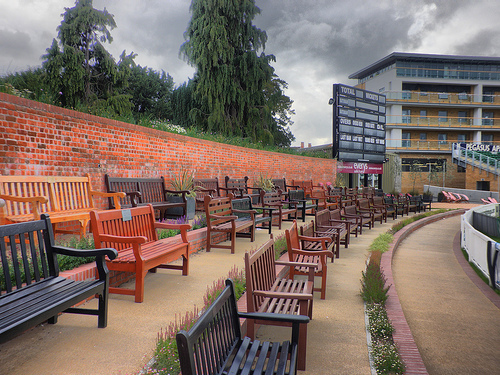 From May of 2011 Sir Christopher has invested more money in the club to update the outside seating area and double its capacity. An artists drawing of the propsed seating is below. 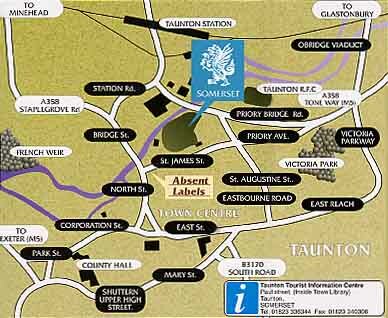 One thing to remember is that we are in the centre of the town. Most of the facilities are mirrored by others within 5 to 10 minutes walk from the ground.